Priority Request - now Gizmo, has fit into our little family perfectly. He loves his 3 other brothers. 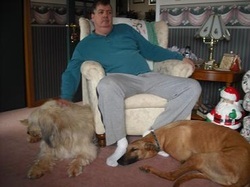 He is a wonderful brother to our half blind and fully deaf German Shepard. He puts up with his following him around and Webster depending a lot on him. He loves his new mom and dad ( sometimes more mom then dad most days). He loves to cuddle up and fall asleep on mom while getting his ears scratched. He's a wonderful boy, and we couldn't imagine not having him. I wish I could find the word to express my gratitude. Gazelle aka corrine corrina bring so much joy into our life. She really was the one for me. Without your teaching I would have Made so many mistakes. I hope you know that all your hard work really means something. It made me not only a better Leader but also a better person. Yesterday we spend the afternoon at My friend who have also a grey. Gazelle first friend . It took a wile for her to relax but we took our time and soon enough they play and run together Omg séeing her run was amazing. We start building her fenced yard this weekend. Cant wait . A soon as a figure out How I will post photos on face book. I m kind of like a grey when it Côme to internet everything Its new!!!! Mgap Its the only reason i got back on the net. The new dogs are amazing. I wish i was closer cause you would have me as a helper for sûre. Once again thanks for helping greys and people have a wonderful life. 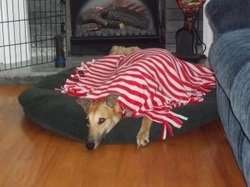 For the last 4 years our family has been wanting to adopt a retired racer, however the timing was never quite right. We recently lost our 18 year old Bassett Hound and our home felt empty, as did our hearts. We have 3 little Dachshunds that we adore, however that empty space still needed to be filled. This was the perfect opportunity to adopt that Greyhound we have been thinking of for so long. MGAP was our first choice as we went to many meet and greets over the years and were impressed by the knowledge and passion these people had for their Greys. We sent an application and heard from MGAP very quickly. The in-home interview was an enjoyable experience! We learned so much, had all our questions answered and very quickly saw that we would become part of a special group of people! Hi Deb, It`s now been a week that Niko joined the family and has been adjusting very well to his new home. •	We have put in practice Directing behavior and ignoring demands, works well. Goes to this bed when we are having meals and when we watch TV. •	Hand feeding with the wait command, not always successful but improving Niko is showing patience when we do this. •	Two daily walks with time for walking, sniffing etc. He enjoys these and is improving on pulling when walking. •	Very good with doing his business outside the house. No accident since he arrived, even goes to the door when he needs to go. No diarrhea at all, stools were solid after two days! •	As indicated in your material we have applied the technique to teach him going up and down the stairs, he mastered it within three days and now he`s up and down and careful when coming down. Loves following us up and down. From our first conversation with Deb on the phone, through the application process, the in-home interview, the online training, the steady flow of conversation by email to answer our many questions to our final training session in Moncton, our experience in adopting our new boy has been outstanding! Last Thursday we were very fortunate to welcome Dizzy (Carolina Tough) into our home and we couldn’t be happier, we don’t know how Deb does it, but she certainly picked the perfect grey for us! Diz (inspired by Disney since he came from Florida) is a very loving and affectionate boy, he’s excellent with our two small senior dogs, is incredibly smart and learns so quickly (responds to his name, comes when called, responds very well to the off/take it feeding games, sleeps through the night and is a pro on walks around the neighbourhood!) While not even a week in our home, Dizzy feels like he’s always been there and is a natural fit with our little family! Thank you to Deb, Rachel, Greg (and Wolf and Sierra), Meghan (and Staal) and everyone else behind the scenes that we didn’t have the opportunity to meet for everything you do! We love how this group is working so hard to give these amazing animals the retirement they deserve! We look forward to meeting more of the group at various activities throughout the year and out and about in our hometown. There is an obvious passion from everyone to do everything they can to make life the best it can be for these incredible creatures and we feel lucky to be part of it! From the time my husband & I decided to adopt a greyhound, it was just luck that we picked MGAP – I put in the application & was contacted immediately by Lona & we scheduled an appointment. She took her beautiful boy, Casey, to our home & it was love at first sight – I knew I had to have one of these beautiful dogs! We were contacted by Deb & scheduled our on line training immediately & it was so educational that I believe everyone should go through a training program like that before adopting any dog regardless of breed. We had owned dogs our entire married lives & we doing so much wrong. I couldn’t wait to get to Moncton to pick up our new boy! When I met him, it was love at first sight again only he was coming home with US! The first night, Silver woke us up around 4:30 am with what they called Rooing & all we could do was chuckle as we never heard such a sound. We did everything Deb recommended! After that he was a perfect boy! Now he is no longer in a crate & sleeps til we get up – is perfect with our grandchildren, perfect with our cat, perfect around the house, perfect with strangers, perfect at clicker class & everyone else that meet him thinks he is perfect!. Just perfect, perfect, perfect! I contribute that all to Deb’s training & us following through & of course Silver. I believe Silver is thriving in his retirement & seems to express thanks to us as his adopters –We feel so honoured to have him. We would like to thank Deb, for setting us up for success, but also Maria for suggesting these beautiful dogs, Nancy for her support, Lona for her support & kindness, Greg & Rachael &, everyone else I have met though MGAP – We feel we have made everlasting friendships & can’t wait to meet more MGAP adopters! Hey deb, The tips you gave us really helped. Winn is doing better every day. He never made a single mess in the house. His stools have been slightly loose on occasion but we have been giving him pure pumpkin as you recommended and it helps. His main issue was our hardwood floors. We consulted the training manual and tips book right away for the floor problem and they helped a lot to fix the problem. He has learned how to jump into the car too so I don't have to lift him anymore which is nice. Everyone is very very impressed with his mild temperament and all around gentle personality. We have been getting a lot of attention on our daily walks and spreading the word. The online training course, gave us all the info we needed to prepare for a greyhound and we learned all of the techniques that we now use for training our grey. We really would not have been prepared for the grey without that extra help. 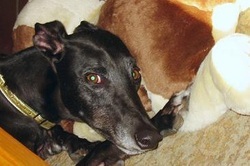 We adopted Casey (Bisonna) on December 27, 2011 and what a great addition to our house. We already had a bearded collie(Angus) and right from the start Casey showed good manners and got along really well with Angus. The online training that MGAP offers was amazing and made all the difference. 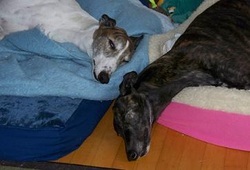 It emphasized the differences in greys and other dog breeds. The leadership part of the training is crucial to having a well-adjusted dog and owner relationship. That really became very obvious once I started using those principles when we brought Casey home. I believe the fostering goes a long way in introducing the grey to life as part of a family and not merely a working dog. The crate training was a breeze, likely because he was already used to a crate in his foster home. The unique training for children has been helpful for training kids how to interact with greyhounds; explaining stress signs, how to pat the grey, why not to hug, and explaining the concept of space etc.. This is very important if children are part of the household, and the fact that it is done with pictures and simple language is very important. I used this with children from 5 to 13 years old. By following the training support, both on-line and in the manual, the transition for both Casey and ourselves was very easy - from waiting for his food to bathroom schedules to off limit places in the home it was non-stressful for all of us. I don't think we would have been so successful without the training and follow up support. I just wanted to send a little testimonial about the on-line training.I have delt with animals most of my adult life. I was a groomer, ran a boarding kennel for 14 years,and I was a crulety inspector for the Moncton SPCA. My last dog had passed away a few years ago and now retired, I decided I wanted to look into rescueing a retired greyhound. After reading everything I could find and doing all my homework (or so I thought) I proceeded to start the adoption process. The application(easy peesy) inhome interview very informative and pleasant. (passed) no problems there. So excited asked Deb if a certian sweetheart(GM John Wayne would be a good match for us even more excited she said yes. Now online training thought this will be so boring, I mean I worked with dogs for years right..? WRONG as I sat riveted to the computed I thought, I know nothing about this breed. Maybe they are more work then I thought....? WRONG! They just want to be loved and for every hour your spend training them they will give you 2 hours of love and joy. Without the online training I would of had so many problems and trained Liam (John Wayne)totaly wrong. Because of Deb and her online training and many emails, Liam has stettled in very well and we are so in love with him. We were so lucky to have had Deb, and Warren and Angela to foster him and thank God for the on-line training. It amazes me how much I didn't know. Again thank you MGAP and Deb!!! Always know you grey is well looked after and very loved, PLUS very well behaved. It's been one month since we adopted Greyci (Special Run) and I wanted to write a testimonial on how things are going. First of all I want to say a big thank you for bringing Greyci into our lives. She is an amazing dog and she fits in perfectly with our family which includes two other dogs (a Labrador and a small Japanese spaniel) two cats and two children, 11 and 14!! The training we received prior to adopting Greyci was the key that helped make Greyci's transition into our home such a success. The training was fun and we all learned so much. Even though I had so many other animals I still learned a lot. Hi Deb, It's been 6 weeks since we brought Bentley home and he has adjusted like a superstar! He no longer cries when we leave or at night and we removed his crate last week. Pacha (our shih tzu) and him are best friends. Actually, I think she's in love with him as she follows him everywhere! He also LOVES the snow! Especially the new fallen one. He'll run around and then lie down and then pounce on Pacha to get her to chase him. She tries to chase him, but he always laps her. lol We also play hide and seek almost every night in the backyard before his walk. I think it's his favourite game. We hide and he seeks. Every day when we get home, he greets us at the door and then runs back to his bed to bring us a bone. He never wants to play wth it... he just wants to show it to us. lol. Another one of my favourite things is when he "complains". He'll groan at least a dozen times a day when he's lying in bed. It makes me laugh every time. Everyone who meets him thinks he's adorable and so well behaved. We couldn't be more in love with him. I have always been a dog person however my Fiance wasn't so I needed to find a breed that would suit her as well myself. I started to read up on the Greyhounds because I had heard a little bit about them. As I read on I knew they were the dog for us. We decided that we wanted to foster first just to make sure they were the right fit. We went to the training session which was awesome! I thought I knew a lot about dogs but the training session really opened my eyes on all the stuff that I didn't know and it was great for my Fiance because she knew very little about dogs. Fostering has been an amazing experience and it has turned my Fiance into a dog lover! By fostering we knew we were helping not only the rescue but the dogs themselves. Little did we know that by fostering our dog would pick us and not the other way around! I think when we first started to foster Romero (his name was Mighty at the time and racing name Regal Late Won) he knew he was home. He fits in so well and we couldn't imagine him not being around. He is the biggest cuddle bug and such a laid back happy guy. I would like to add my two cents worth of comment as a testimonial - about the importance of the pre-adoption-of-a-greyhound session MGAP provides. I considered myself an experienced dog owner before the training in Moncton. Was I in for a surprise. I learned more in those few hours than I thought possible. There was so much information given that afternoon I was mentally exhausted. 1. Adoption 'possibles' need to put all their previous thoughts about 'dogdom' aside so that their minds are open to accepting what differentiates Greyhounds from other dogs. Yes, biologically they are canines, but in reality everything about this particular breed has to be learned afresh. MGAP helps to establish this fact. 2. 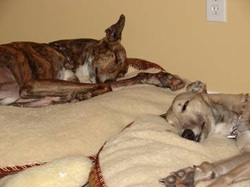 Greyhounds, although beautiful, responsive, affectionate - all their lives need a special understanding. MGAP convinces you that this is a 'must'. Do not adopt a Greyhound if you are not prepared to commit to this. 3. It is vital that new adopters get to recognise dog body language, especially in relation to Greyhounds. As I said earlier, I had no idea. All wagging tails were equal to me. MGAP taught me differently. 4. I adopted my Ruby 15 months ago. That time has been a period of constant learning - for both of us. Ruby has learned that its OK to play only in the last few months. The first time she played with a ball I cried, it was so sweet to see at last. It brought home to me how bleak her life must have been for 4 years with no time and no-one to encourage her to have fun. It took her a year to realise she was safe to just be foolish every now and again. 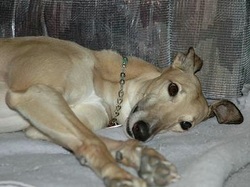 New adopters have to learn that every Greyhound learns at their own pace, and that patience should be a pre-requisite to taking a Greyhound home, and they must have respect for the breed. I have the MGAP training information in my mind every day. I have never forgotten it, and am thankful for it. Without that resource, there would have been panic-attacks in my house every other day at first. The information was solid, well-researched (backed up by years of experience), practical, sensitive, and eminently useful. The continuing link through MGAP, and that training session, has been of enormous help and reassurance. Judith Bayliss Greyhound admirer, respecter, cherisher and someone who will never ever own any other breed. We adopted Foster (formerly Hal/Scooby) just this past June and it's already hard to picture our lives without him. Foster was a graduate of the prison program, so he came to us trained in most basic commands. We were floored that he was able to walk so well on a lead from the moment we first held his leash. Everywhere we go, people comment on how he is so well behaved and, of course, on what a handsome boy he is. We did much research prior to submitting our application to MGAP and are happy to say that Foster exceeded all expectations. He exudes the positive characteristics traditionally associated with this noble breed. Foster is intelligent, friendly, graceful (most of the time), in love with all things soft and all things "food", quiet, eager to please, and most importantly, a loyal companion. Even Charlie (our cat) was quick to warm up to Foster, especially once he discovered how to scoop out left-over peanut butter from Foster's Kong. From start to finish, we were thoroughly impressed with the MGAP adoption process. The balance of professionalism and compassion serves the program well, while the training and information we received is second to none. We are especially thrilled with the knowledge that anytime we have a question or concern down the road, support will be only a phone call/email away. All new parents should be so lucky. As a vet student, I was looking for a dog that would fit my busy lifestyle. I have wanted a dog my whole life and am fascinated by dog behaviour and training and was eager to welcome a canine companion. Spending a lot of time in the veterinary field, I have been exposed to many breeds and the greyhound stuck out as being one of the most wonderful in terms of a family pet. Some classmates of mine had already gone through the Maritime Greyhound Adoption Program and had great success so I did not hesitate to start my application procedure. I was very impressed with the interview and training program provided by the Levasseur's and think that it is so beneficial for both first time dog owners and seasoned owners alike. I was matched with a petite red fawn female named Lisa now known as Ellie. She is quiet (unless she is left alone! ), gentle, easy going and absolutely up for anything. She would go anywhere and you never have to worry about her impeccable manners! We graduate from obedience class next week and she has done very well. We can't wait to start agility! 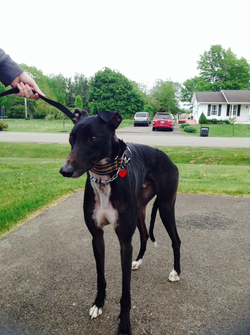 Thanks to the MGAP program for providing these beautiful hounds with a second chance. We adopted Chester on April 23rd and are some glad he was paired up with us! At first we were to wait until May or June but Chester was available and his situation in foster care was like a match made in heaven. Chester is a simple fellow, he likes hugs, food, sleeping, walking outside and going totally crazy outside ... He loves the "let's play" command and he learned that one with little effort! What's great is that he also knows the stop command hehehe! We like to call Chester our little excited southener because he's from Florida and he tends to be on the excited side when he meets people. We are actively working on his social skills but what's great is that there is not an ounce of mean in him, always pure happiness which is easy to deal with! So in short, Chester is easy going, cuddley and happy! We are happy to have him with us on so many levels. He's a great addition to our home, he gets along with our parrots (he doesn't really pay any attention to them) and he brings joy to our family. If we had to qualify Chester's adoption in one expression it would have to be, as I mentioned earlier, a match made in heaven!!! This is my testimonial for my dogs Townie and Cora, but first I just wanted to tell Deb, thank you for making the choice to bring Townie and Cora into our lives! 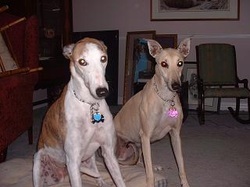 In January of 2008 we knew we wanted to get a Greyhound, we had always loved to see the grey's in the parades. So we had been searching web looking for rescue site when we came across M.G.A.P and as a family filled the online form. With the information from the training sessions and the in home interview we knew this was the breed for us. Telly Our fur friend Telly came to us in the middle of May 09. She has been such a wonderful addition to our family. After having a beautiful Westie for 16 years I was absolutely against having such a "large dog". After meeting someone and getting to know her Greyhounds, I couldn't resist. They are so loving and gentle and so very quiet. My first concern was to have a dog that was very good with our children, if we were able to find one that loved our kids, we could work through any other issues we might have with our new family member. As it turns out, she LOVES our girls and they love her too. She has been a very good dog, loves her new home, her stuffed bunny, her new bed, etc. She loves going on her daily walks with us and we have found her quite easy to train. We certainly learned a great deal in Deb's training session. We learned that we did A LOT wrong with our last pooch. We are determined not to make the same mistakes with Telly. It would be easy to fall into that trap with those beautiful big brown eyes! We have successfully kept her out of the kitchen and kids rooms, and taught her some basic commands with ease. 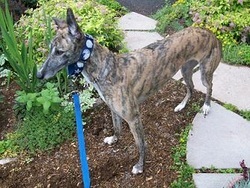 Dear MGAP, We were looking to adopt a dog, when we thought about adopting a Greyhound. We went to the Maritime Greyhound Adoption Program's site and realized that they where very interesting dogs and may be what we were looking for. We have two sons (age 5 when we adopted our Grey, last August). We were a little nervous about adopting a large, mature dog like that, but after contacting the association, we where told that we will receive a lot of information and complete "family training" before we adopt. That training was very helpful for us and the kids. On top of that we also received the in home visit of not one, but two persons to discuss the matter before proceeding to the next step. After adopting, we quickly realized, nothing was exaggerated but very accurate information that was given to us. Especially for the kids, they where taught what to expect, what to do or not to do etc. last February, 2008 Darren and I lost our 10 year old diabetic Rottweiler to aspiration pneumonia due to complications from larynx paralysis; a few years before that, we had lost our female rottie to Immune Mediated Haemolytic Anemia at the age of 5, and to say the least we were “gun shy” about bringing another dog into our lives after going through all that pain. We had decided that if we did get another dog, it would be a rescue dog. After seeing the greyhounds at various meet and greets around the city and lots of research in to the retired racers, we decided that when we were ready, it would be greyhound that we adopted. In the fall, after eight months, the house felt so empty that I took the plunge and made the application on-line, and we went to a meet and greet at the Moncton Farmer's market to see the greys one more time. When Lisa and her grey, Lily came for our in-home interview, we were sure that we were making the right decision and that we were ready to adopt. The training session gave us a lot of great information to prepare us for Veil's arrival into our home. I still keep the training manual close at hand. Veil stole our hearts right away, but we started to notice that she seemed to be lonely and she was not at all sure if she was supposed to play with us or not. She spent a lot of time in her crate with the door open. After a month, when the next load of greys arrived, we decided to get her a big brother. That is when Beckett bounded into our lives. He and Veil adapted to each other within a very short time. Veil's personality blossomed; we joke that we should have renamed her "Princess" because she certainly fits the bill; she has a regal air about her, like a refined little lady. When Beckett came to the house, you would think that he lived in a home all of his life. He makes us laugh with all of his crazy antics. He has a shoe fetish (never chews them, just likes to put them on his bed), loves to wipe his head on damp towels and he throws his toys in the air and catches them on the rebound. Veil is very smart, (we may be prejudiced) but she quickly learned down, sit and shake and I think Beckett learned from watching her perform. 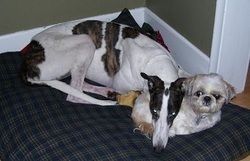 Just wanted to say thanks for picking these two for us and for everything MGAP does to help the retired racers. My husband Carl and I have loved our retired Greyhound Indie for two years now it seems like our family could never have been nearly as complete without her to cherish every day. We are so thankful for the Maritime Greyhound Adoption Program it's an amazing program that rescues and matches these extraordinary creatures with caring individuals and families looking for a wonderful companion. From day one, the dogs are welcomed into their new world with love and a passion for teaching them about their new life of freedom. 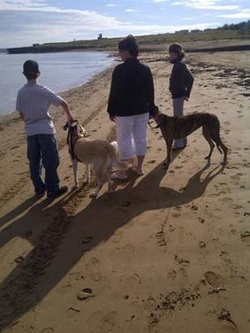 We had heard many times about what amazing family additions Greyhounds make so our expectations were high! To our surprise and joy, Indie has far surpassed them and brought more to our daily lives than we could have ever expected. I have heard many similar stories from other Greyhound guardians. Their love of playtime and gratitude for any (and all!!) comforts in life is incredible. Dash, originally named Hannibal, became the newest addition to our family on July 1, 2009. He has been a happy go lucky guy with an awesome personality. He is so gentle and loving and listens quit well for such a short period of time. In just over a week, he has stolen the hearts of our family including our 8 year old girls and our cat, Digger, as well as friends, neighbours, and even strangers that we meet during our walk. He’s a very social type of guy. I am so glad to have had the opportunity to take Deb’s Dog Behaviour course because he would have been an easy fella to spoil right away, and unbeknownst to me, that is exactly what I could of done without the valuable information from Deb, SPOIL him. Rob and I learned a great deal about Grey’s and dogs in general that came in handy right from the moment Dash got into our van for the drive home from Moncton. I strongly recommend that everyone who loves animals adopt a Greyhound, but not without taking Deb’s Dog Behaviour course. I just wanted to take the opportunity to thank you for bringing Grace and Finnegan into our lives. Although they were in homes previously any hesitation or apprehension we may have had about this was quickly dispelled. We bonded with them and loved them from day one. They made the transition into our home so easily it wasn't like getting two re-homed dogs at once at all. It was like they had been our dogs all along. As for Finnegan, his age was never a factor. In fact, if I had to do it over again I would insist we get this laid back senior boy. No regrets about him. It's like his 8 years has made him wiser and kinder. He is always patient and understanding with our kids and as loyal to me as I could ever want. It is hard to believe some one could decide to give him up. He's a charmer for sure! Gracie has been a bonus for us because as you know the plan was for Finn only until we heard he had this beautiful lady friend. Grace is considered to be our 7 year old son's girl. She loves the extra attention he gives her. He adores her! Everyday her shyness lessens. Everyday she gets braver. Just weeks ago she conquered the stairs, something she would never do before. We like to think it's our love for her that gave her that extra courage. She now lives on two levels of the house instead of just one! She has two more levels to maybe one day conquer but if she never does we do not care. We love Gracie just as she is. Deb, thank you so much for all that you have done for us. 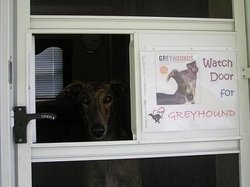 You and your family's involvement in the Greyhound adoption cause is commendable. The whole process of registration, interviews and training, shows how serious and caring you are about these amazing dogs. You made us feel welcome into a great friendship of people sharing a passion for the retired Greyhounds and their well being. The training session was very interesting and covered a wide range of topics. Thomas loved it and understands the principles perfectly. 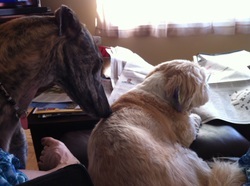 Joseph has learnt the kids/dogs rules and is making a good effort. The adoption manual is very well done and easy to refer to. We're having a great time with Sam; he's fitting in really well with our family. He's a happy boy, very curious and obedient, he likes to be around people and he's a real sponge for affection. He walks beautifully on leash and on occasions, when something is blown around by the wind, shows us his sighthound character: ears pointed forward, eyes hyperfocused, neck stretched forward, his muscles tensed and well defined, what a sight! We had just purchased our house and started thinking about getting a dog. We did a lot of research into different breeds of dogs and wanted one that would be playful but not high strung, one that was good with children and a saint when it came to cats (we have a feline that could make a grown man shriek). But one of the most important stipulations that we had was that we rescued a dog from a shelter, a home that didn't want him or from a group that specialized in breed rescues. But on one fateful day after wondering the mall I stumbled upon an entire pack of greys and their owners. Oh my! I rushed home to tell Dany of my discovery, he had just finished reading about MGAP group in the local paper, so we were both on the same page and eager to learn more about this breed that until now had eluded us. Back to mall we went and spoke with the owners and Deb. 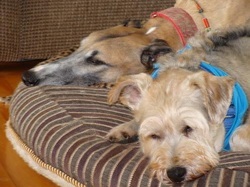 We were impressed with the group's dedication to finding permanent homes for these hounds. "You just need to fill out an application, read this information on the group, read a bit about the breed, have an in-home interview and then you can be on your way to adopting a grey" Deb said. Now that's a group of people who have their priorities straight we thought, and boy were we right! We were very eager and lucky. We only had a short 1 week wait from the time we filled out the application until the day we brought our Asher home. From the moment I walked into Deb's garage and saw Dany holding the leash of that beautiful hound I knew he was ours and instantly felt a bond with him. Now I don't want anyone to think that first couple of weeks were a complete walk in the park, only that we felt blessed to be able to help such a deserving soul. Asher has been with us for nearly two years now. What did we ever do without him? He blends into our little family so well. Even Randy the cat (although I'm sure she would deny it) has learned to like him. He is a loving, gentle and fun dog to have. When he looks at us with his big brown eyes, we have no choice but tell him how handsome he is and how much we love him! Deb raised $750 for IPDTA Dogs In Need Fund through her on-line auction. Because of Deb, yet another dog will live. MGAP constantly raises the bar in terms of helping dogs in needs. Deb has created a program that places dogs directly into a home or in a foster family. The program will also assure that all dogs are taking care of from the time they enter the program and for the rest of their life. She focuses on a positive approach and will speak up with regards to any methods that are not inline with the values and beliefs that she has put in place. For creating several comprehensive training programs, MGAP is the best. The Pre-Adoption training program is given free to all adopters that get dogs from her organization. Deb spends an average of 4 hours with all families to make sure that they have the knowledge and confidence required to bring a dog into their family. This is presented with a Power Point presentation as well as with other learning aids. Deb has also created a training program for the foster families. This program is designed to help the foster family in making sure that the dogs are ready to go into their adopted family and that all dogs leaving the program have had the same training. As part of her curriculum, Deb has created several key lessons that are targeted to all members of the family. In addition, she has developed a variety of instructional materials designed to meet the different learning styles of her students. Deb is also very involved in the community by educating children in schools and/or community groups about Dog Safety. She makes it her responsibility to research and provide the latest information to all members, adopters, and the community. Deb also teaches Canine First Aid and this has helps many dogs of all breeds. Under her guidance and leadership, the Maritime Greyhound Adoption Program has now brought up and placed over 500 Greyhounds into loving homes. She operates on a set of values and beliefs that promotes positive dog adoption and does not let others take her away from her beliefs. Deb strongly believes that education and support is a key element in order to prevent potential behaviours that may lead to the surrender of a dog. She also believes that education is mandatory for all adopters to make sure that they understand the level of commitments required in order to adopt a dog. For her devotion to her program and the training she gives adopters. Deb will devote her entire weekends to teach new adopters what they need to know before getting their dogs. She will also support each family individually through private consults and training sessions when needed. In addition, Deb plays an active role in introducing new dogs to a family who already has existing pets to make sure they are a good fit. She provides free behaviour consultation to her adopters and uses training to support all adopters. 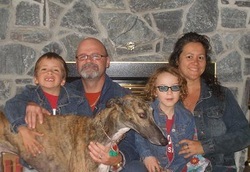 Deb Levasseur has truly created a unique program in order to provide training and support to families adopting greyhounds. She focuses on positive training methods and promotes dog safety. She is not afraid to stand up for what she believes in and she is always trying to find ways to make the program even better than what it already is at this point. All dogs that enter the MGAP program is taken care of from the moment they step into our program until the day they pass on and all of this is because of Deb's innovative ideas and values. 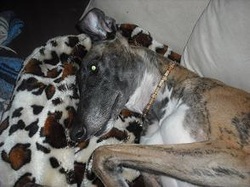 Deb has helped rescue through her program MGAP, many greyhounds. After rescuing them and putting them into homes, she assists families in the rehabilitation in order to help the greys adapt to their new environment. Deb has definitely gone above and beyond any other group that I have researched in terms of education. 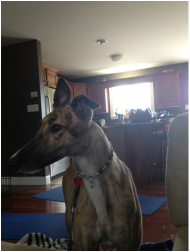 She has the most complete training process for all potential adopters who are loooking to get a greyhound. Education is focused on positive dog training methods, dog body language, dog safety, leadership, etc. Deb has trained many of her members to be great MGAP ambassadors who help in giving educational sessions at some workplaces, camps or schools and even other types of events. She has even developed a canine first aid course. Deb has put many hours in training adopters. She gives individual support to each family and will provide consultations with other family pets if necessary. Her training and support makes adopting a greyhound much more simple. She makes sure that all the families are on the right track and that they have the proper knowledge to move forward with the training of their new dog. Deb is an amazing person who works tirelessly on helping Greys and humans fine each other for life. She took the time to match Guinness and myself perfectly; I couldn't imagine a better fit between a human and a Grey. 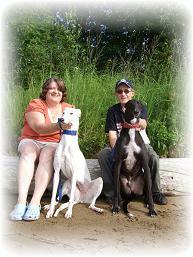 Deb Levasseur is the Founder & President of Maritime Greyhound Adoption Program. Deb gives so much of herself day after day to ensure that every greyhound she rescues is placed in a permanent and loving home. If any issues arise, she is there to counsel and to train the dogs and adopters for as long as it takes. She dedicates her time to this cause willingly and passionately even cutting into her personal family time with her husband and children. She opens her arms, her heart and her home anytime to help a dog in need! This year, Deb has put together a top rate Canine First Aid Course Manual and teaches this information and helpful course, aided by hands-on demonstrations with Casper the "first aid dog mannequin".